I must be reliving my childhood with this recipe for Tater Tot Casserole with Green Beans and dang it does taste good. It came to light a few years ago that not everyone knew the deliciousness of a tater tot casserole. What? Didn’t everyone’s mom brown beef, add soup, cover in tater tots and bake for an hour? Apparently not, poor things. Tater Tot Casserole and it’s many variations were in regular rotation at our house, and we all loved it. I also like being able to make a Crock Pot Tater Tot Casserole without paying attention to it. Of course, I hadn’t made or eaten a tater tot casserole in 30 plus years until a few years ago. Someone brought us dinner when my son was in his car accident. I should say that MANY friends brought us dinner. But one was a tater tot casserole, and my kid’s minds were blown. What was this thing that mom never made and when will she make it for us? Well they can quit asking after a year and a whole remodel later I finally made one for my poor, deprived kids. 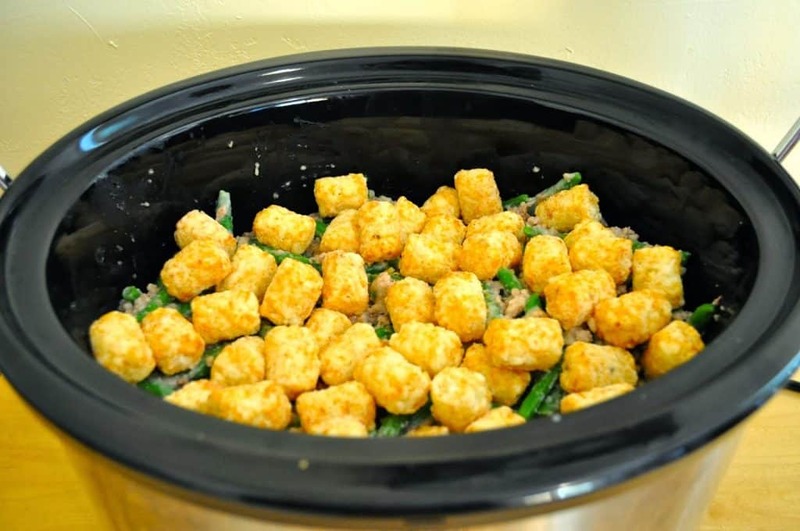 I made it an easy tater tot casserole, in the crockpot, so we could eat it after a long day of being out and about. It was perfect, hot and comforting. I’ve already been asked to make it again and twice as big, believe me, I’ll keep the easy part too. I’ve been scolded for not covering this Crock Pot Tater Tot Casserole in cheese.  Some people believe it must be piled with shredded cheese. My mom never covered her tater to casserole in cheese? Did yours? If yours did and you want cheese on it, by all means, add cheese in the last ten minutes of cooking. Remember that I love to give you recipes to work with, you make them your own. I also added green beans to my casserole because I love tater tot Casserole with green beans. Again, it’s what my mom did so I did it too. If you like other vegetables, feel free to experiment with adding those instead, but in my opinion, green beans work best. I think my mom added vegetables to everything so we were always fully vege-nated as kids. I do it too. It doesn’t hurt this casserole to have green beans or other vegetables in it; it does need something else in there besides beef. 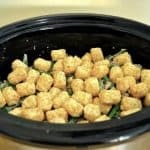 Make-ahead Crock Pot Tater Tot Casserole. Could there be anything better than making the number one casserole in America easy and hands-free?? Cooking times are dependent on YOUR slow cooker so if your cooker is really hot well then maybe you only need 4-5 hours on high or maybe it needs longer? Make this on the weekend for the first time so you know how long your crock pot will take and you're not left disappointed and hungry when you can least afford it. So if I do this in the oven; 350* for 45 minutes? Does that sound about right? I've never made this before but I'm sure the kids will love it!